Evgeniy Grunin probably felt that he was lucky when he learned that he was going to spend his time as a conscript on an airbase in the GDR. He was no doubt attracted to flying machines, because he had already built a kite large enough to lift a person. E. Grunin was 20 years old when he arrived at Altes Lager. The two VVS regiments based there at the time were the 833 Fighter Aviation Regiment equipped with MiG-21PF "Fishbed-D" and, until 1968, the 116th Guards Fighter-Bomber Aviation Regiment (GvIBAP) - the latter was then transferred to Brand with its MiG-17F "Fresco-C." He was going to make the most of his three-year stay (1967-1969) in the GDR to accomplish something really special. Thus, Evgeniy Grunin and his buddies Svyatoslav Maklakov and Vladimir Kurilenko built a glider that they dubbed Optimist" in complete secrecy during their time in the Soviet Army. All of 1968 was devoted to airframe design planning, design documentation, and procurement of materials and equipment in the barracks attic room for manufacturing the aircraft. All their work was carried out after curfew and during personal time. None of them slept more than 4-5 hours a day. Sometimes they didn't sleep at all due to night duty. 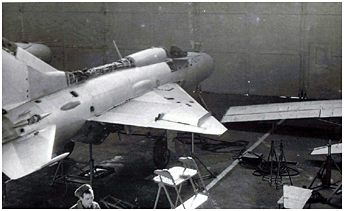 The glider these amateurs built was housed inside the MiG-21PF maintenance hangar. 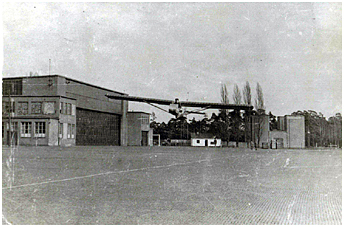 The latter was in fact the main premises of the 125.ARZ (literally "Aircraft Repair Plant"). There, the "Fishbed-D" and other MiG-21 versions were undergoing a comprehensive periodic maintenance involving complete disassembly and life extension of 300 flight hours. Service was tense, with extra duty, permanent night work, and the usual hassle accompanying the work of mechanics, technicians, and minders. Conscripts in the role of ordinary master mechanic and operator performed most of the work. About 200 career servicemen constituted the nucleus of that unit. It is quite extraordinary that the knowledge of the building of this glider could have remained confined to restricted circles. Should senior officers or counterespionage services have heard of this project before it left the hangar for its first flights in 1969, there is no doubt they would have put an end to this adventure. 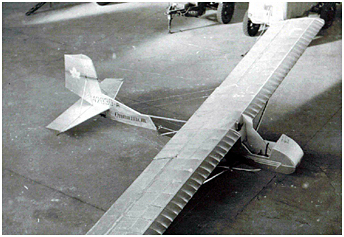 In order to build this glider, the designers had to take into account the fact that only the materials at hand on the airbase could be used. Thus, the wing built entirely of wood was covered with bed sheets. 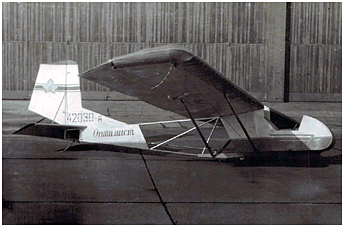 In the absence of 1mm thick plywood, the wing leading edges were not skinned and that made the "Optimist" look like a glider dating back to the 1920s. 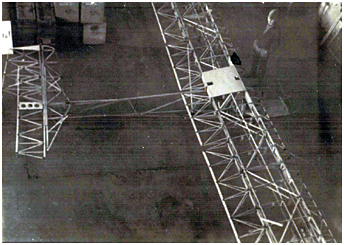 The twin-spar wing was reinforced with truss spars and braced by two struts and one cable stretched between the fuselage and the wingtip. 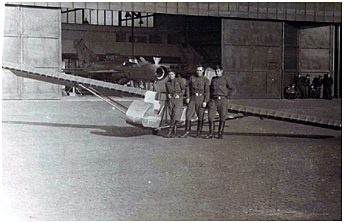 German carpenter's glue and epoxy-type K-153 were used throughout the glider construction. The fuselage was a 25x25mm duralumin truss. Almost all corners had holes and other damage, as they had been removed from the benches in the hangars. The cockpit was made of mahogany veneer. The basis of the design of the lower fuselage was a ski made of two halves of 12mm thick plywood and transverse brackets forming a box. The parked glider rested on a 240x90mm wheel and sprung rubber-ring steel springs. Duralumin supports were installed in the outboard wing panels. Two pairs of cables 3.5mm in diameter stretched between the wings and the rear fuselage prevented tail boom and empennage torsion. Ailerons and elevator controls were rigid, whereas the rudder was controlled by cables. The wing and tail fabric comprised three layers of "homemade cellulose dope" - celluloid pouches from soap dishes and toothbrushes dissolved in acetone. The entire outside of the airframe was painted in the paint shop using MiG-21 paint in three layers, plus varnish. The full cycle of construction took 11 months to complete. All was revealed when, in October 1969, the finished glider was rolled out of the hangar for its first flights. Svyatoslav Maklakov, who prior to being in the army flew Blaniks in the 2nd Moscow City Flying Club, piloted the glider. He made more than a dozen fly-bys and flights at altitudes of 10-20 meters, taking off from the taxiway near the hangar. The GAZ-69 that was the personal vehicle of Colonel Gusev, the commander of VCh/PP 42030A (the 152.ARZ Military Unit/Field Mail number) (1), was used as a tug. After a brief investigation revealed the absence of any "criminal intentions" - desertion from the unit and a flight to West Berlin - everyone relaxed and the builders of the "Optimist" to everyone's relief were demobilized right away. The glider was finally suspended from the hangar ceiling. The trio had planned to build a motorized glider using a 14-hp motor from a German motorcycle with sidecar. For obvious reasons, the command element prohibited further work. However, after demobilization, Yevgeniy Grunin built a motorized glider after all. This article is extracted from a forum about Russian aircraft homebuilders > Link. With many thanks to "browser1" for the additional informations. After serving his term in the army, Yevgeniy Petrovich Grunin built several aircraft. One of them was the famous ESKA-1 (Ground Effect Amphibious Rescue Boat) that was a small seaplane able to fly in ground effect > Photo. After building the ESKA-1 and lacking a complete higher education - at that moment he was a student at the MIIGA (Moscow Civil Aviation Engineer Institute) - he was hired by the Bartini Design Bureau as a 2nd Category Designer. He worked there nearly 2 years and then moved to the Kamov Helicopter Design Bureau, where he worked on a modification of the Ka-25 (the Ka-252 that led to the Ka-29), and a modification of the Ka-26 (Ka-126). After two years with Kamov, Grunin worked some six years at the "Energiya" Scientific Production Association where he was directly involved with the "Buran" program. It was he who proposed and drew the diagram for transportation of the "Buran" space shuttle on the back of a Myasishchev M-3 bomber. In either 1982 or 1983, he went to the Sukhoy Design Bureau. By 1985, he had become a lead designer in Section 100 of the Sukhoy Design Bureau. This was the Promising Designs Department. All aircraft such as the Su-27 or the Su-26, appeared in this department. The redesign of the Su-26 in 1984-1985 (Su-26M) occurred at the initiative of Grunin himself. Then, there were the Su-29 and Su-31. Following the successes of the Su-26, he simply asked to occupy himself with other subjects and, for some reason, his name as a developer was removed from all Su-26 drawings. In 1985, he led the efforts on the "Ground-Attack Aircraft 90" (Shturmovik 90 > Link) and on several designs of the "Special-Period Ground-Attack Aircraft." He was dismissed from the Sukhoy Design Bureau in 1992. Later, he formed his own design bureaus. These were Roks-Aero, Aeroprogress, and so forth. He was General Designer at "Khrunichev-Aviatekhnika" from 1994 or 1995. He now is General Designer in the private TKiT Design Bureau in Moscow. (1) VCh PP (Voyskovaya Chast Polevaya Pochta) = Military Unit/Field Mail.